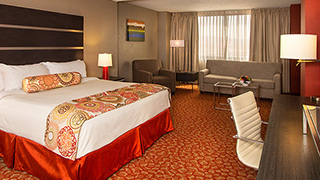 At the center of all Reno has to offer, Grand Sierra Resort and Casino provides the most accommodations of any casino hotels in Reno. With more than 1,900 elegantly appointed rooms and suites, access to an 80,000-square-foot casino, 11 award winning restaurants, cafés, bars, and lounges, and more than 200,000 square feet of meeting space, our Reno hotel and resort provides an inclusive, never-have-to-leave experience for discerning casino players and vacationers. Our casino hotel and resort amenities also include an RV park, live entertainment with top acts from around the globe, dancing till dawn in LEX Nightclub, and an array of events, including regular casino tournaments. Novice and experienced gamers will relish our expansive casino one of the largest casino hotel in Reno. Guests can enjoy table games, slots, video poker, a live poker room, and tournaments offering prizes including cash or free play. GSR also offers live betting in our race and sports book and a players club where you can earn points faster than ever before. 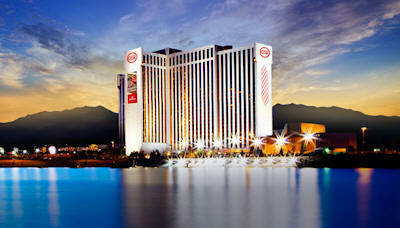 Grand Sierra Resort is home to the largest convention space and meeting rooms of all Reno casino hotels. We can accommodate gatherings of 10 to 4,000 people along with full-service catering. Whether our guests are planning a wedding or a corporate retreat, GSR has a variety of unique venues along with full catering service. We also offer guests the luxury of a full-service spa and salon, fitness center with weightlifting machines and cardio equipment, and regularly scheduled group fitness classes. At Grand Sierra Resort we cater to families too, with a host of activities to provide hours—if not days!—of family fun. Our guests can play miniature golf, ride go-karts, and skydive at Grand Adventure Land, or enjoy FunQuest video arcade and laser tag, a 50-lane family bowling center, and Grand Sierra Cinema movie theater. We also offer Sierra Bay Aqua Golf, Reno’s only over-water driving range, plus the added benefit of an indoor simulated golf course that allows guests to play top golf courses like Pinehurst II, Pebble Beach, and Harbour Town without ever leaving the resort.